This beautiful mini-plate is handmade in Spain and features a traditional pattern of pink and yellow flowers with green leaves and blue scrolls. A gift evocative of warm, sunny days and Mediterranean charm. Send someone your best wishes with one of these delightful Spanish plates / wall plaques. It can be displayed on a wall or in a cabinet, or form part of a collection. Detail: The wall plate measures 9.5cm (3.75") in diameter and there is a hole on the back for hanging. 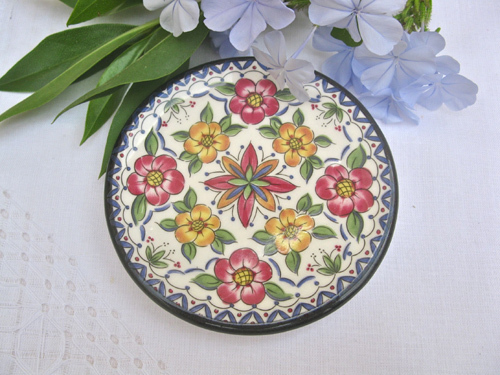 Our little Spanish floral plate ~ Vera is a lovely way to pass on your warmest wishes and inspire feelings of a relaxed Mediterranean lifestyle. Comes gift-wrapped, like all our presents - and we can print a personal message on your behalf.